I'm running Windows 10, and recently got a new docking station, and needed to disconnect a display port shown by the dock as "active". 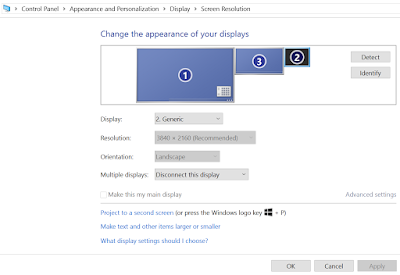 In Windows 7, the monitor disconnected and the icon in "Display Settings" for the specific monitor would go gray, and still be there. Clicking on the gray icon >> "Extend desktop to this display" >> Apply. In Window 10, the display disappeared when I disconnected it in "Display Settings". Hitting "Detect" revealed absolutely nothing! Click "Adjust screen resolution" under the "Appearance and Personalization" section. Et Voila! There's your missing monitor!